Green Life Beach Residence Town Houses is the hot new phase of the prestigious and iconic Green Life Beach Resort, awarded with the prize "Best holiday complex for year 2011". The mini resort is composed of several phases and is located on Kavatsite beach, approximately 2 km away from the ancient town of Sozopol and 5 km from the resorts Duni and Chernomorets. The resort has its own private beach of fine sand, which offers great opportunities for relaxation and water sports. The place is ideal for long holidays, as the owners and their guests will be provided with absolutely everything they might need without having to leave the complex. First floor - 1 living room with kitchenette and dining area, 1 bedroom, bathroom and veranda. Second floor: 2 bedrooms, 2 bathrooms and a veranda. The total area is 153.20 sq.m. First floor: 1 living room with kitchenette and dining area, study, bathroom and veranda. Second floor: 3 bedrooms, 2 bathrooms and a veranda. The total area is 157.40 sq.m. The villas in the complex will be offered finished and ready to be furnished. The investors will provide furniture packages and option for an individual choice of furniture , depending on the requirements of each client. The newest phase “Town House 4” (22nd, 23rd, 24th Townhouse Groups) is expected to be completed in May 2020. 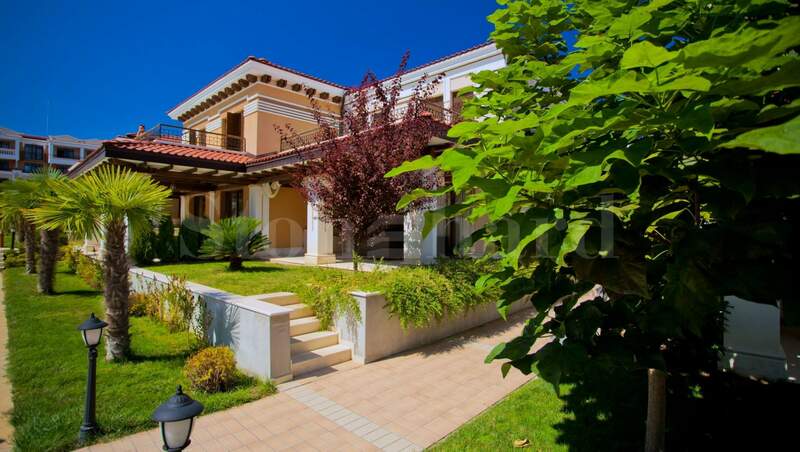 The houses are offered in "turnkey" condition, equipped with bathroom and lighting fixtures. There are ready houses (from 11 to 21) that are offered at 100% payment. In addition, the owners and guests of Green Life Beach Resort will be able to enjoy at preferential prices all the facilities and the infrastructure. This includes a deluxe hotel, modern sports and recreation center, a variety of entertainment spots for children, active sports areas, shopping zone, restaurants, cafes, bars, and well-maintained beach area with fine sand, sun beds and umbrellas. 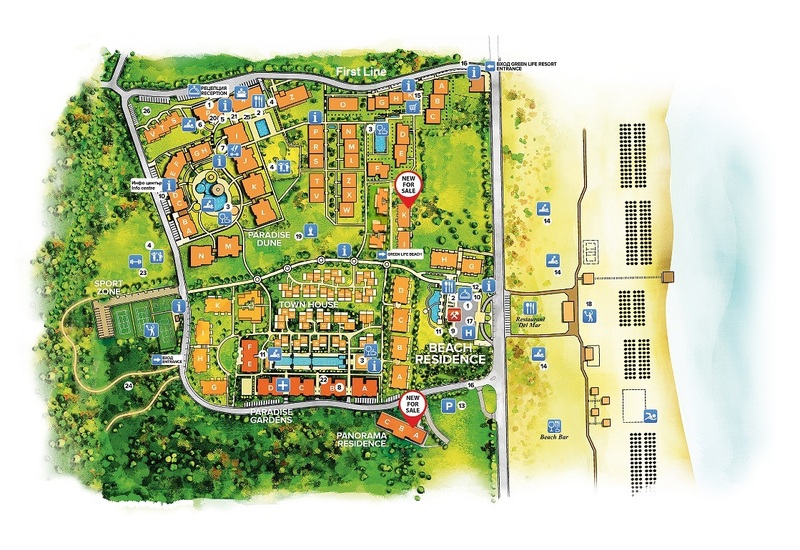 Green Life Beach Resort is surrounded by plenty of greenery and several water zones. The complex has four swimming pools with a total area of 600 sq.m, divided into two main groups, flowing into each other. They feature waterfalls and streams, pool bar and mini slides. Professional property management will be offered by the registered management company "Orko". All owners of Town Houses are required to pay an annual fee for maintenance of the complex of 1500 Euro. • Usage of the parking area. Each town house shall come with luxurious finishing works, including proper flooring, walls latex painted in a base color, fully prepared and equipped bathrooms with water heater, sink, toilet. The town houses will come with installed lighting fixtures, switches, plugs and an air conditioner in the living room. Each apartment has internet and cable installation. Green Life Beach Residence complex features Mediterranean style architecture, where soft pastel colors were used for the faзade and the interior. The garden is arranged with plenty of greenery including flowers, trees, and water areas. This makes for a cozy resort, arranged in harmony with the surrounding buildings and scenery. Green Life Beach Residence is part of the prestigious and iconic Green Life Beach Resort, winner of the prize "Best holiday complex for year 2011". The mini resort is located on the beach Kavatsite, about 2 km. away from the ancient town of Sozopol, and 5 km from the resorts Duni and Chernomorest. At the same time, it is set 17 km away from the resorts Pomorie, Primorsko and Kraimorie. Bourgas International Airport is placed at a distance of 35 km. The complex has its own private beach of fine sand, which provides an opportunity for peacefulness and relaxation. The beach is divided into two parts: one for sunbathing and the other one for entertainment. The region offers opportunities to practicing of various sports including parachuting, hang glider flight, yachting, trips with tourist boats, beach train rides and much more. Onsite are organized beach massages, exercises, gymnastics and yoga. Sozopol is known for its small and quiet streets, historic buildings, churches and cultural events. It is placed in immediate vicinity and could be reached by the attraction train Green Life Beach Resort at every 30 minutes. Bourgas city is situated 30 km away from here, while the International Airport Bourgas is placed 40 km away from the complex. Green Life Beach Resort is an operating complex, where are offered various services, amenities and private beach. • Supermarket for basic food products, fresh fruits and vegetables, cosmetics, home and lifestyle products, etc. • Outdoor Italian restaurant with Mediterranean atmosphere, exquisite fish dishes, fresh salads, a variety of vegetarian dishes and children's menus. Breakfast buffet. • Professional property management: administrative services, insurance, cleaning, laundry service, etc. The town houses could be rented on a hotel basis by the registered management company "Orko". Owners shall pay an annual fee. The town houses at Green Life Beach Residence Town Houses complex can be reserved immediately with a non-refundable deposit of 5000 Euro, payable by credit card or by bank transfer. Upon paying the deposit the apartment will be reserved for the period up to the signing of the preliminary contract - within 28 days. 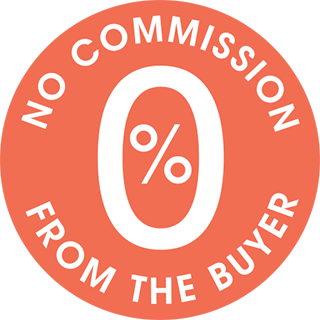 No agency commission is charged. Average price levels in the complex: 1300 Euro / sq.m - 1600 Euro / sq.m. Town house prices start from 199 000 Euro. The price list is valid for 100% payment (Standard Plan A). • 30% third installment upon agreement.